Lancaster, Pennsylvania-based Christian metalcore quintet AUGUST BURNS RED will undertake a U.S. headlining U.S. tour from July 10 to August 8. Joining the band on the 24-city trek are BLESSTHEFALL, ENTER SHIKARI (July 10-27), ALL SHALL PERISH (July 28-August 8) and IWRESTELEDABEARONCE. The romp across the country will also feature a first for AUGUST BURNS RED — multiple-night stands in the markets of Pomona, California and Lancaster, Pennsylvania. 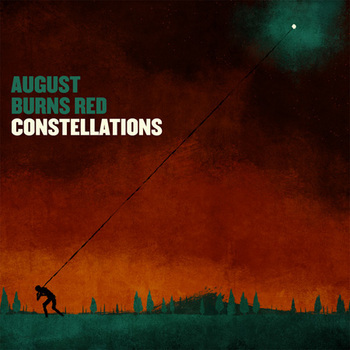 AUGUST BURNS RED will release its third full-length album, "Constellations", on July 14 via Solid State Records. The visual themes for "Constellations" echo the band's career-long fascination with spirituality and destiny. "'Constellations' is about directing our attention towards heaven, trusting that God will direct our steps, regardless of our circumstance," says drummer Matt Greiner. "The kites in the artwork represent our own intelligence and innovation. So often we trust our own abilities to guide us through life, but the 'wind' of life will send our kites soaring every which way." AUGUST BURNS RED spent the past year conquering fans at Warped Tour, on the Take Action tour and at destinations from Dubai to Dallas, and increased their profile through placement on the movie trailer for "The Spirit". Meanwhile, fans drove AUGUST BURNS RED's MySpace plays well past the 17 million mark, packed the band's fall 2008 headlining tour — which included sold-out venues across the country — and flocked to the band's in-studio Stickam site by the tens of thousands to observe the band recording the eagerly awaited new album. Fans' demand for new material also drove the release of a B-sides EP, "Lost Messengers: The Outtakes", this past February. These reverberations from "Messengers"' massive grassroots success have set the table for what — if the fans have anything to say about it — is primed to be one of the year's most anticipated metal albums. "We've been paying more attention to the dynamics of the songs," says guitarist and principal songwriter JB Brubaker of the new album. "We wanted the songs to breathe in certain places and explode in others." For anyone afraid that might mean ABR is mellowing out, Brubaker is quick to assuage fears: "I can say for sure that this record will definitely be as unrelenting as our previous ones, but at the same time it will also be more dynamically diverse."